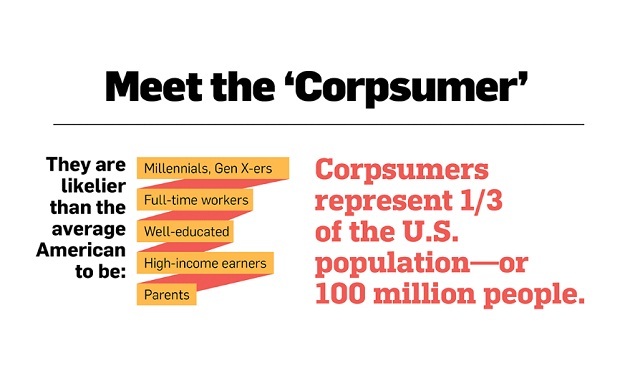 Meet the Corpsumers Who Care as Much About a Brand’s Values as Its Products #infographic ~ Visualistan '+g+"
For some people, choosing a new car or deciding where to shop for groceries is a matter of value. For others, it begs more questions: How do those companies treat their employees? What’s their stance on philanthropy? How eco-friendly are they? More than a third of the U.S. population ages 18-80 belongs to that second group, according to a new study from public relations firm MWWPR. Those brand activists, nicknamed “corpsumers,” make up “a bigger segment than so many of the segments that brands target—bigger than millennials, bigger than moms,” noted MWWPR chief strategy officer Careen Winters.